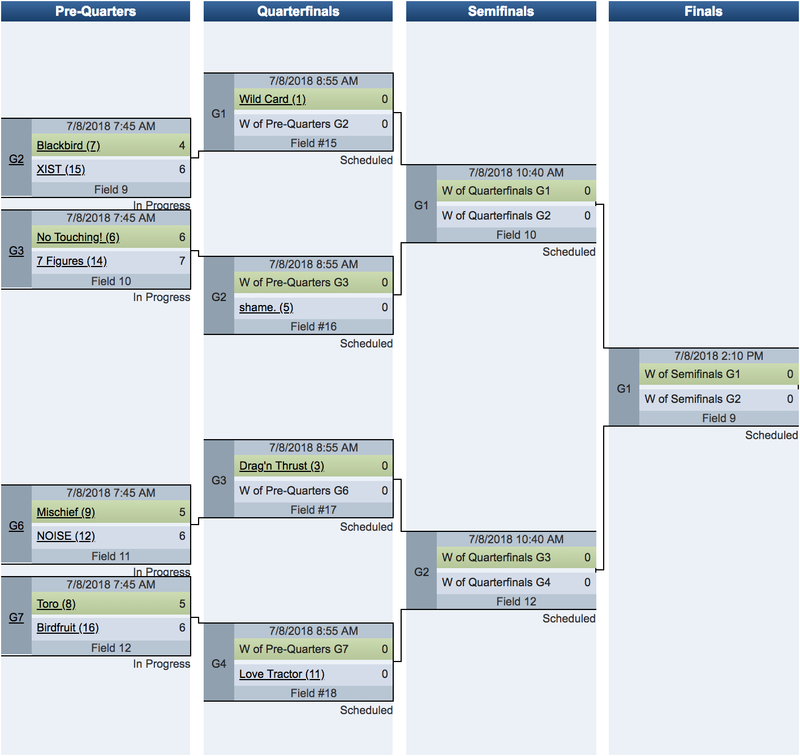 BROOMFIELD, Colo. — In classic Mixed Division fashion, only one pool went to seed, and two top seeds ended up at the bottom and out of the bracket at the Pro-Elite Challenge on Saturday. Double game point drama, hard cap scores to make the bracket, and teams who look surprisingly polished this early in the season: there’s been plenty of fun stories already. Oh, and a lightning delay has the prequarter games in limbo. Three of the four Select Flight teams attending the Pro-Elite Challenge made prequarters, and each one beat a Nationals qualifier from the previous year. Some might write those wins off to roster turnover from last year, but even with that, Seattle Birdfruit and New York XIST both had double game point battles against established programs. As teams some might view as “make-weight,” Birdfruit, XIST, and Los Angeles 7 Figures looked fast and up for the challenge posed by the competition. Two double game point losses to Fort Collins shame. and San Francisco Mischief certainly showed they could compete, and in each game they had a shot to win. Those games sandwiched a big win over Connecticut Metro North, and the Seattle team went into their prequarter matchup with Durham Toro feeling confident they could come out on top. Their O-line defense earned back turns with quickness and aerial skill, particularly from Natalie Jamerson and Luke Jesperson, while their D-line showed a willingness to grind and make every throw a tough one. Birdfruit came into this tournament with something to prove, and they’ve done it so far. Meanwhile, Los Angeles 7 Figures relied on their big pickups to make plays downfield. Brian Stout was an unstoppable aerial threat, and his presence forced teams to adjust on defense instead of dictating what 7 Figures could do. Having that kind of release valve is invaluable, and it gives LA a margin of error they’ve missed over the years. Minneapolis Drag’n Thrust looked like the most complete team in Colorado on day one. You already know about Sarah Meckstroth and Brian Schoenrock. 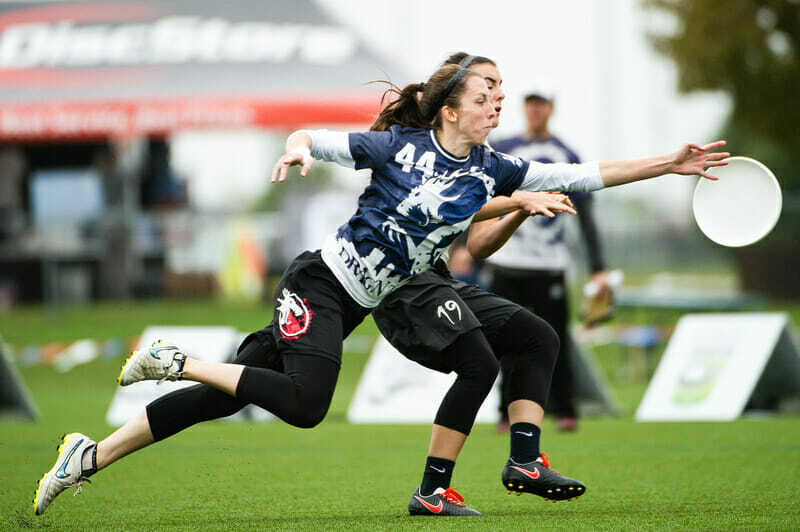 Year after year, they consistently keep Drag’n Thrust near the top of the division, but new pickup Emily Regan jumped in and made an immediate impact. She made several heads-up blocks in throwing lanes, and her defense sparked break opportunities for Minneapolis. Tyler Thomegreene, another newcomer, looked quick in the cutting space and gives Drag’n another weapon to stretch the field. They looked like the fastest team at the tournament so far and have to be seen as the favorites to take an early TCT title. Denver Love Tractor also played well today, with Jack McShane and new addition Jesse Roehm showing great chemistry together against other established teams. McShane had the disc in his hands seemingly every other throw, and his field vision continues to put Love Tractor in position to win. Roehm showed why he was a cutting mainstay for years on Denver Johnny Bravo, pushing for space and opening up Denver’s offense downfield. Hallie Dunham took on a huge portion of the throwing burden for the D-line offense, and her throwing ability helped Love Tractor convert break chances at a good clip. Drag’N Thrust and Love Tractor are on a collision course and will likely meet in the semifinals. It should be a fun one. Boston Wild Card looked strong as well, overcoming an early deficit against Madison NOISE to win 12-8, and flashing their depth in their wins over Durham Toro and Pittsburgh Alloy. For a team getting prepped for WUCC, they are here to win. Despite a compressed early season schedule with a tough Boston Invite a mere two weeks ago, Wild Card’s mix of veterans and fresh talent have them in contention for a win at the Pro-Elite Challenge. While turnover wasn’t a perfect predictor for a team’s fortunes, Connecticut Metro North, Cincinnati Steamboat, and Dallas Public Enemy each failed to live up to expectations and missed the bracket. Don’t be shocked to see these teams pull it together later in the year, but they’ve dug themselves in holes that could prove difficult to escape. Margins for error are thinner than ever, and a tough early season tournament can have lingering effects in the bid conversation. Fort Collins shame. looked strong as well, especially after Nick Lance arrived after the first round. They’re in the running to win this tournament as well, and look like they’ve turned things around after their disappointing Fort Collins Solstice performance in June. In case you missed it, a lightning delay rolled in during the final round of play on Saturday. Teams will pick up their games where they left off bright and early on Sunday, but it could hurt teams riding high off of good performances on Saturday. Both New York XIST and Seattle Birdfruit were leading their respective prequarters matchups (over San Francisco Blackbird and Durham Toro, respectively), and the delay could give Blackbird and Toro the chance to reverse course and come back. Comments on "Pro-Elite Challenge 2018: Mixed Day One Recap"